Over the last half century, Sigma lenses have won the respect of the photographic community thanks to their excellent build-quality and expert optical engineering. Sigma’s knack for consistently delivering sharpness and dependability across an impressively diverse range marks it out as a brand to be taken seriously by both novice and professional photographers. There aren’t many lens manufacturers that are able to cater to such a wide spectrum of budgets and uses while maintaining such high standards. 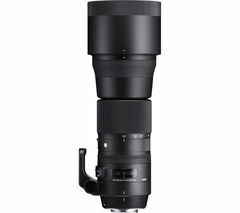 These days Sigma produce lenses for both Canon and Nikon mount cameras, as well as Micro Four Thirds and Sony A mounts, so most DSLR and mirrorless users will find a wide choice of lenses to pick from. Our Sigma camera lens collection reflects the brand’s diverse offering. At the top end of our range you’ll find serious wide-angle lenses like the 12 - 24 mm f/4 DG Wide-angle Zoom Lens (available for both Canon and Nikon) and telephoto lenses like the 135 mm f/1.8 DG HSM A Telephoto Prime Lens (also available in both Canon or Nikon models), which offer sophisticated specialist performance for landscape or portrait photographers. Both lenses have attracted glowing reviews within the professional photographic community. 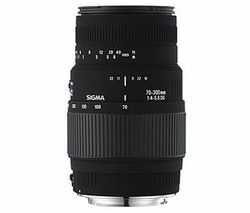 Sigma is well known for the quality of its budget lenses and both novices and seasoned pros will appreciate the value for money offered by affordable but surprisingly sharp lenses like the 70-300 mm f/4-5.6 DG Macro Telephoto Zoom Lens. Whether you’re a professional snapper or new to photography, you’ll find everything you need in our extensive photography department. Looking for your next lens? We’ve got loads of lenses to choose from, whatever your budget and whichever mount you have – check out our Canon lenses or view all Nikon lenses today.